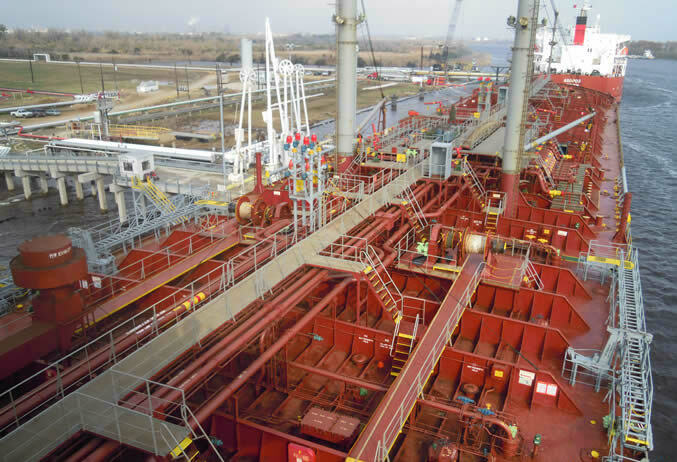 This month Waterfront Shipping Company, a subsidiary of Methanex Corporation, will start operating a new fleet of 50,000 dwt ships which can run on methanol, something the line’s president is adamant is a cheaper way to go green. “The cost to build new and convert existing vessels to run on methanol is significantly less than alternate fuel conversions,” said Jone Hognestad the president of Waterfront in a release from engine maker MAN B&W, which is supplying the engines to the new ships. “Methanol is a biodegradable, clean-burning marine fuel that reduces smog-causing emissions such as particulates, sulphur oxides and nitrogen oxides,” MAN B&W said in the release. Waterfront Shipping will charter the seven vessels to replace older vessels and expand its fleet. Two of the vessels are owned by Westfal-Larsen, two vessels are jointly owned by Marinvest and Waterfront Shipping, and the remaining three vessels are owned by Mitsui OSK Lines. The ships were built by Hyundai Mipo Dockyard and Minaminippon Shipbuilding. The first three vessels are being delivered in April, with the remaining four to be delivered by October 2016. Waterfront Shipping operates the world’s largest methanol ocean tanker fleet with its fleet comprising 22 vessels from 3,000 to 50,000 dwt. It is mooted there is not enough methanol to go around at the moment to support large scale adoption of methanol as a fuel for shipping but the Raitt suggested supply could be ramped and scaled up should demand be there.